Raising and improving your high school GPA can pay HUGE dividends in your future in terms of scholarships and college acceptance. GPA: Unweighted GPA & strength of curriculum. Test Scores: SAT, ACT, PSAT, and SAT subject tests. Spike: How you stand out with your extracurriculars. Typically, to ensure college & scholarship success you want to keep your unweighted GPA at the 3.7+ range. We understand that if you are in 10th – 12th grade and your GPA is lower than that it may be impossible to get it to this range even if you get only A’s the rest of your high school years. If this is the case, I want to assure you that you will be fine! You will still go to a good college, qualify for scholarships, and go on to be successful! The fact that you are reading this right now tells me something about you. You are ambitious, want to succeed, and are willing to put in the work and effort to make that happen. Why stress for students to have a 3.7+ unweighted GPA? Looking to get into elite universities like Stanford, Harvard, UC Berkley, etc. Looking to get thousands in scholarships to help pay for college. When you have a 3.7+ GPA this increases your chances to getting into these elite universities and getting large merit based scholarships. I am not saying you CAN’T get scholarships or be accepted into these elite schools with a lower GPA. I am just saying it will be more difficult. Take the RIGHT High School classes. Possibly avoid private High Schools. Retake any past classes you got a C or lower in. Talk to your current teachers for classes you have a B or lower in. Seek out a tutor for classes you have a B or lower in. Your first 2-years of High School set your foundation for your High School GPA. Because you apply for college the fall of your senior year. This means colleges only count your grades from 9th – 11th grade. If you don’t start strong you are going to have a hard time raising your GPA even if you get all A’s your 11th grade year. Stay organized using our 7 tips for the most successful planner. Develop good study habits by following our 6 good habits to build for college! 2. Take the RIGHT High School classes. Possibly avoid private High Schools. Pushed into all the AP/honors classes the High school has to provide. Placed into an elite, expensive private or charter High Schools that has rigorous educational material. Now, I am not saying that these AP/honors classes are “BAD” or going to these expensive private or charter High Schools is “NOT HELPFUL”. They can be VERY BENEFICIAL to some students. Most colleges focus on your unweighted GPA & DO NOT take the High School your student attended into account. High school you are currently attending (Public vs. Private). However, these colleges will only take this into account when you pass the “unweighted GPA test”. What is the unweighted GPA test? The unweighted GPA test is when you have at least a 3.7+ unweighted GPA. Unweighted GPA: GPA based on a 4.0 scale. Where an A= 4, B =3, C=2, D=1, F=0 no matter if it is honors, AP, college, or regular. Weighted GPA: GPA based on a 4.0+ scale. Where an A could count as 4.5 points or 5+ points, B = 3.5 or 4, C = 2.5 or 3, etc. for taking honors, AP, or college classes. This depends on what your high school decides. Only after you have a high unweighted GPA will the more selective colleges even look at your application. The 3.7 unweighted GPA test is not the “golden standard”. In fact, I made up the definition. However, based on average GPA data an interviews with dozens of admission advisors the 3.7+ GPA range makes logical sense. What actionable advice can you take from this? If you want to get into an elite college like Stanford, Harvard, or MIT you will need to take the most difficult classes your high school has to offer. 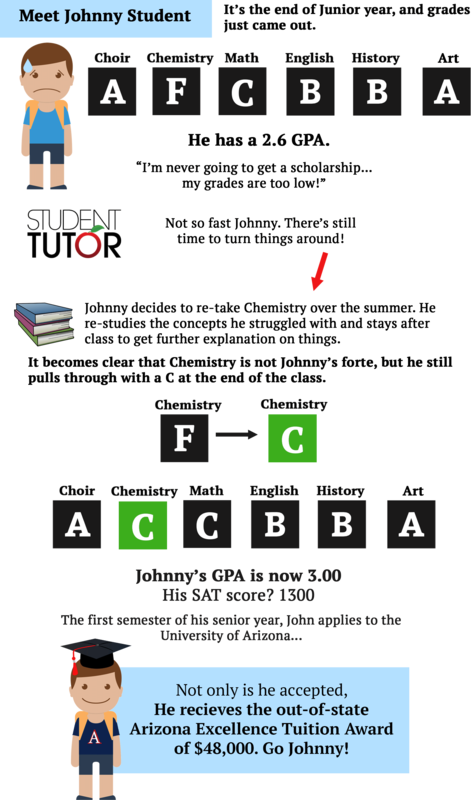 However, if you are getting mostly C’s & B’s in them this will not help you! Fact: It will hurt your college & scholarship chances. If you can afford it and you want the best education for your student a private high school can arguably provide better teachers and a more optimal learning environment. However, many times private high schools have very rigorous material making it difficult for students to maintain high unweighted GPA’s or keep up with the pace of the class. If this is the case for your student we would recommend you move your student into a public high school and use the money you saved to hire a private tutor. 3. Retake any past classes you got a C or lower in. Bad grades happen and both parents and students sometimes make misinformed decisions as you might have learned above. If you didn’t start out your high school years strong or enrolled in a rigorous high school and your students is not doing well, don’t give up! There are several ways for you to ditch that ugly letter grade and get a newer, shinier one to take it’s place. Retake classes through an online accredited high school or a community college. Typically, students apply to college early their senior year of High School. While senior grades can count slightly toward your admissions, colleges will look primarily at your GPA from 9th – 11th grade year. What happens when you have a bad semester and get a 2.6 GPA? Is all hope lost? Please Note: The above example is only showcasing one semester. Colleges will typically look at your commutative core GPA over the course of 9th – 11th grade. If your 9th – 11th grade GPA is a 2.6 you will need to retake multiple classes to raise it to a 3.0. Use our free high school GPA calculator to determine what you need to do! 4. Talk to your current teachers for classes you have a B or lower in. Trust me when I say you should always, always, always talk to your teachers about how to do well in their class. It’s a no-brainer — It’s THEIR class, and THEY are the ones giving you grades for the assignments. Plus, they want you to succeed. When you have a grade of B or lower, ask them to show you what you did wrong and if there is any extra credit opportunities. If you don’t understand a concept or instructions, RAISE YOUR HAND. And if you still don’t, stay after class to sort it out. Any time your teacher says something more than once about a quiz or assignment, write it down. They’re not just talking for their health! This goes for anytime you have something clarified or ask for further instructions from your teacher. You can reference it later if you forget it. 5. Seek out a private tutor for classes you have a B or lower in. Some classes are hard and no matter how much you study, reach out to your teachers, and may need professional help. There are dozens of different tutoring services available. Don’t wait until last minute to get help. Get help before you are really struggling otherwise it is going to be impossible to raise your grade. Click here to learn more about our national recognized private tutoring service! 6. Bonus Tip: Pull Up Middle School A’s. If you took a class in Middle School that was taught at a High School level, there’s a chance you can pull that grade up and average it into your High School GPA. Please Note: You only want to do this if you got an A in the class. It makes no sense to pull up a B unless your GPA is below a 3.0 average. First, check to see if you earned any A’s in High School level courses. The most course that most often comes up with 8th grade Hon Algebra. Next, talk to your counselor about pulling that bad boy up! Improving or raising your high school GPA can pay huge dividends in terms of college & scholarship success. 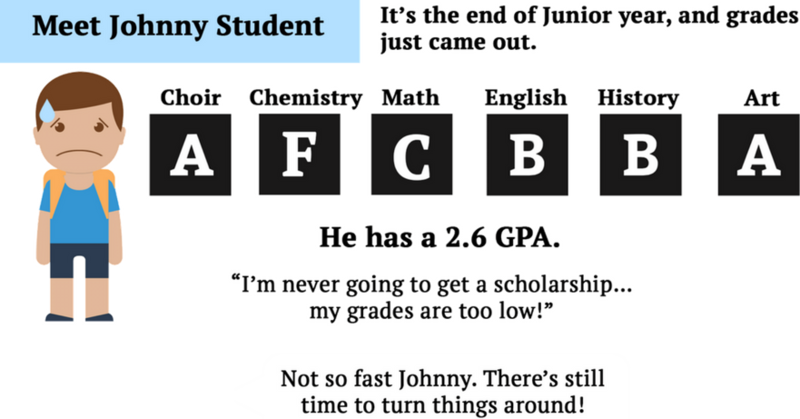 If your GPA is lower than a 3.7 follow our 5 tips to help improve it. 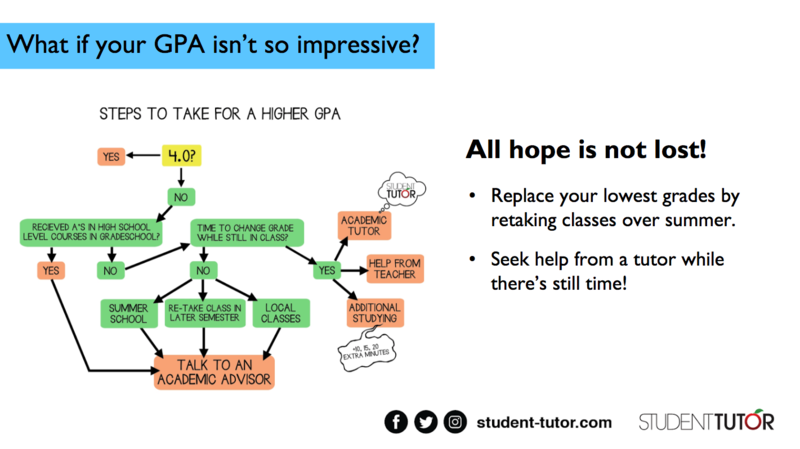 Do you want actionable advice, student & test prep checklist and more based on your current unweighted GPA, weighted GPA, SAT/ACT/PSAT test scores, and grade level?